The Villa JAVACANOU offers an exceptional view of the Marigot bay. Provided a small private beach and a pontoon, it will seduce all lovers of diving and water activities. 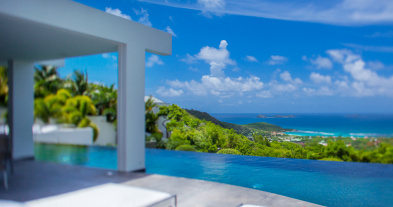 Villa JAVACANOU is a contemporary 3-bedroom in Marigot, located just steps from the beach. This fully air-conditioned villa enjoys breathtaking ocean views. The middle level leads to the entrance. Located downstairs is the open main room with a spacious kitchen, dining area, and separate seating area. Situated on one end of the main room is a media room, which can be closed off. The living room is very contemporary and nicely decorated in white tone. This spacious room accommodates a gourmet kitchen which is separated from the living room by a large counter. Stairs lead up to the 3 bedrooms, each with a king-size bed, U.S satellite and Apple TV, and an ensuite bathroom. 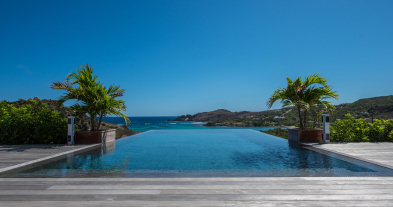 The exterior features ample seating, including a swing bed on the large terrace and an oversized daybed under the gazebo next to the large infinity pool. Just below the terrace is a small private beach area with a daybed, seating, and direct access to the beach and water. The Villa JAVACANOU also comes with a canoe, paddle board, and snorkeling gear for exploring the bay. Air-Conditioning, TV, Sound System, Dining Table, contemporary living room with furniture of high quality, large white sofas. Facing Marigot bay. Fully equipped Kitchen, Microwave, Dishwasher, Blender, Toaster, Nespresso Machine, Coffee Machine, Steam Oven, Oven, Kettle. , Large breakfast bar. Queen Bed, Satellite TV, Apple TV, Safe, Walk-in Closet, Air-Conditioning, Sea View, Ensuite Bathroom, 2 sinks, Walk-in Shower, Hair Dryer. Modern and chic outdoor lighting, charming atmosphere.